The fight between Goku and Vegeta continues. Majin Buu makes Dabura his first victim after a few disparaging remarks anger him. When Majin Buu's power explodes for a moment, Vegeta and Goku realize his true potential and decide to put the fight on hold until Majin Buu has been taken care of. However, as Goku searches for the senzu, Vegeta knocks him out. He takes the last senzu, claims responsibilty for Majin Buu's rebirth, and vows to defeat Buu himself. Meanwhile, Babidi orders Buu to kill Gohan and Kaioushin. Gohan grabs Kaioushin by the arm and quickly races away at top speed, but Buu effortlessly catches up and with one hit, he knocks Gohan out of the sky and possibly out of "This World." Gohan and Shin continue to put up a futile fight against Majin Buu. Finally, both Gohan and Shin seem to be unconscious or dead. As Babidi prepares to finish off Shin, he shows some faint signs of life and Babidi runs off. He orders Buu to kill Shin, but just as Buu prepares to eat him, a spear plunges through his midsection. Dabura has returned. Buu pulls the spear out and advances on Dabura. Meanwhile, Goten and Trunks have arrived at the mountain where the Z Senshi originally gathered and Trunks has made the enormous mistake of breaking stone Piccolo, thus making it impossible for Piccolo to return to normal. Buu turns Dabura into a cookie and eats him after a short fight. As he prepares to do the same to Shin, Vegeta shows up and destroys the space ship. The fight between Vegeta and Majin Buu begins as Piccolo and Kuririn are returned from stone by Dabura's death. Vegeta and Majin Buu fight. For a while, it seems Vegeta's on top, but Majin Buu simply uses the opportunity to show off his incredible regenerative abilities. Finally, Vegeta really angers Buu and Buu responds with an enormous explosion that seriously injures Vegeta and seemingly kills Shin. Despite Piccolo's protests, Goten and Trunks race to Vegeta's aid. After throwing Buu out of the way, Trunks and Goten shake Vegeta back to consciousness. Meanwhile, Piccolo appears behind Babidi and, after a brief battle, kills him. As Buu reappears, Vegeta urges Trunks to take care of his mother. He knocks out both children and sends them away with Piccolo. Piccolo and Krillin escape to a safe distance as Vegeta charges up his ki and self-destructs in an effort to blow Buu into so many pieces that even he couldn't regenerate..Vegeta's attack finally finishes. When it's all over, Majin Buu is gone and Vegeta is just a stone in the sky. The stone falls to the ground, shattering on impact. Eventually, Piccolo goes to survey the damage, and much to his shock and fear, all of the little bits of Majin Buu begin moving around, eventually completely regenerating. He races back to Krillin and they together decide to go to God's Palace while Babidi hatches a plan to cause immense suffering on Earth instead of simply destroying the planet. Piccolo and Krillin return to God's Palace to consider their next move and allow the kids to rest. Videl and the others go searching for the Four Star Dragon Ball, having already recovered the other six. Their goal is to revive everyone Majin Vegeta killed. As they work at getting the final Dragon Ball, Goku finally awakens, alone on what was the site of his battle with Majin Vegeta. Goku can not sense Vegeta's ki and instantly translocates to God's Palace. Goten and Trunks continue resting at God's Palace as Piccolo fills Goku in on everything that's happened. They try to come up with a plan and ultimately decide to teach the children a technique Goku picked up from the Metamoru-sei-jin called Fusion in which two fighters become one, using their combined strength in addition to a massive power upgrade. Meanwhile, Bulma and the others summon Shenlon to revive everyone who Vegeta killed. They phrase their wish so that it revives everyone who died that day who was not bad! In the crater Vegeta left behind, Kibit awakens. Kibit searches out Shin, and upon finding and healing him, the two go find Gohan and teleport to Shin's planet, Kaioushin Kai. Meanwhile, Chichi, Videl, Bulma, and the others finally hear about what happened to Gohan (who they believe to be dead) and Vegeta. Majin Buu and Babidi arrive at a large city and, in his effort to find Piccolo, Goten, and Trunks, Babidi broadcasts to the entire world as Buu turns the population of the city to candy and eats them. His order is to bring him Piccolo and the kids or suffer the same fate as this city. Babidi finishes his threat on the world with an ultimatum -- if he doesn't receive Piccolo, Goten, and Trunks in five days, he'll kill everyone on Earth. On Kaioushin Kai, Gohan is healed and is given a brief explanation of the Zed Sword, a legendary sword that Kaioushin plans to have Gohan use against Majin Buu. Meanwhile, at God's Palace, Goten and Trunks finally awaken and, after hearing of the deaths of Vegeta and Gohan, prepare to learn fusion. On Kaioushin Kai, Gohan goes to work on the Zed Sword. He initially has trouble, but after turning Super Saiya-jin, he finally manages to pull it out. Back on Earth, Babidi and Majin Buu obliterate another city. A crowd appeals to Hercule to save them once again, and he promises to do so after he perfects his latest technique (his attempts at flight). At God's Palace, Goten and Trunks watch the destruction of the city unfold via Babidi's little transmission to everyone on the planet, and finally resolve to learn fusion, which they were apparently still undecided on. They have been unsure about Fusion as Goku was sleeping whilts Gohan and Vegeta were killed, he did not help them. The kids believe the reason for this is that Goku was weak. The annoying woman from the Tenkaichi Budokai contacts Babidi and lets him know that Trunks lives in the Western Capitol, because she wishes revenge on Trunks after how he defeated her son at the Budokai. Babidi announces the news to the world and says he's heading off there now. Realizing that the Dragon Radar will be destroyed with the city, the Z Senshi try to come up with a plan, and Goku comes up with something pretty simple. He'll delay Majin Buu while Trunks goes home to get the radar. Trunks sets off for the Capsule Corporation building, and Goku teleports to Buu, turning Super Saiyan 2 as he mentions "...something that surpasses the Super Saiyan which surpassed Super Saiyan." In order to stall Babidi and Majin Buu while Trunks searches for the Dragon Radar, Goku begins an explanation of Super Saiyan. He first fades out of Super Saiyan and begins with his normal state. He then turns Super Saiyan, and then Super Saiyan 2. Babidi scoffs at Super Saiyan 2, stating that he hasn't really changed very much (keep in mind, Babidi and Majin Buu can't sense ki). Goku ignores the comment and prepares for a third transformation, much to the shock of the Z Senshi, watching from God's Palace via Babidi's worldwide transmission. 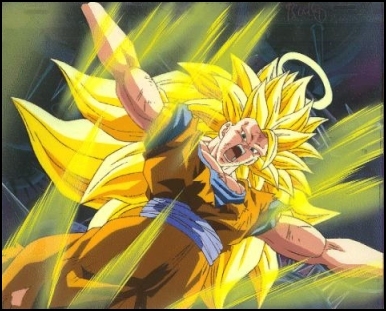 After transformation, Goku emerges on a new level, Super Saiyan 3. From there, he begins an attack on Majin Buu as Trunks searches for a Dragon Radar that simply can't be found at the Capsule Corporation building in the Western Capitol. Eventually it is found and Bulam are able to return all those that Majin Vegeta killed at the tournament. Back at God's palace the kids are so impressed by Super Saiyan 3 that the begin to take a real interest in Fusion. After some tough training they ask Goku to see Super Saiyan 3 again, Goku agrees only if they promise to train. By using Super Saiyan 3 Goku uses up his last few minutes that he has on the Earth and returns to the afterlife, leaving Piccolo to train the act of Fusion. Buu remembers the words that Goku told him about a stronger fighter coming along, and decides to wait for him against Babidi's advice. Buu subsequently kills Babidi, however the Earth is still in danger as Buu begins to kill more people. Buu is like a young child, he just wants to be loved. A young blind boy is not scared by Buu as he can not see, and when Buu restores his life, the boy states that he can not do anything but love Buu for what he has done. Buu leaves the boy and decides to rest, so he kills some people and makes them in to a house. However Buu still has one competitor left, and that is the World Champion Hercule. Hercule plans many tricks to kill Buu, but is unable to go through with any of them. It seems that Buu is not bad he is just an innocent who is easily lead. As the Earth is in turmoil, snipers are going around killing humans, they arrive at Buu's house and almost kills Hercule which makes Buu go mad, so mad that he rejects his evil self, which manifests in to a separate being. So now there are two Buu's.